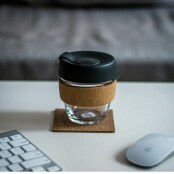 This fab new Tea Caddy is the perfect plastic free option to buy your tea! Filled with Red Berry Tea, this is a punchy, full on infusion of mixed berries, fruit & hibiscus with all natural ingredients. 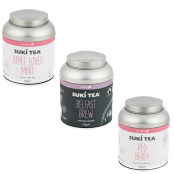 Wow, a real fruit flavour from a tea, finally Plus you can keep your Suki Tea fresh with these brand new embossed Tea caddies, you can pop these on your shelf and refill them up again and again! This tin tea caddy is filled with 125g of Red Berry, fruit infusion. We're so proud of these tins - how pretty are they going to look in your home! Plus it's your plastic-free, refillable option! Under the pretty label, these brand new embossed tea caddies have our iconic sketches on them, perfect to pop up on your shelf and top up again and again, yes please!